Kfar Vradim (Hebrew: כְּפַר וְרָדִים) is a town (local council) in northern Israel, with a population of 5800 (2008). It is situated south of Ma'alot-Tarshiha and about 14 kilometres (8.7 mi) south of the border with Lebanon. Kfar Vradim is close to Ma'alot-Tarshiha (2 kilometers), Karmiel (16 kilometers) and Nahariya (20 kilometers). In 2017 it had a population of 5,546. Kfar Vradim was established in September 1984 by Stef Wertheimer to create an industrial town in rural surroundings. The first families were mostly workers of ISCAR Metalworking, owned by Wertheimer, which manufactures metal blades and high performance cutting tools. Kfar Vradim is located near Ma'alot-Tarshiha and Yanuh-Jat, and is connected to the highway by Road 854. Road 8721 runs through the town, connecting it to Yanuh-Jat. As of 2018, there were contentious plans to build 2,200 new housing units, more than doubling the number of households in the town. Kfar Vradim is situated between 550–620 meters (1800–2050 feet) above sea level, providing for a relatively dry and Mediterranean climate. Peak temperatures in Kfar Vradim in summer typically reach about 38 °C (100 °F), while its January and February temperatures can drop to as low as −2 °C (28 °F). Average temperatures range from 10 to 15 °C (50 to 59 °F) in the winter to 28–32 °C (82–90 °F) at summer. Precipitation is mostly between October and March and is mainly made up of rain showers and scarce snowfall. Kfar Vradim has an elementary school (Keshet school) and a middle school (Amirim middle school) which is also a high school since 2013. ^ Lynfield, Ben (18 March 2018). "Arab rights group blasts 'racist' decision halting land sales". Jeruselem Post. Retrieved 26 July 2018. 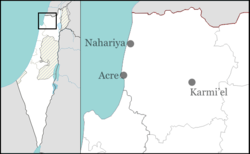 ^ "Israeli town halts tender after Arabs buy up land". Times of Israel. 18 March 2018. Retrieved 26 July 2018. Wikimedia Commons has media related to Kfar Vradim. This page was last edited on 3 March 2019, at 14:00 (UTC).